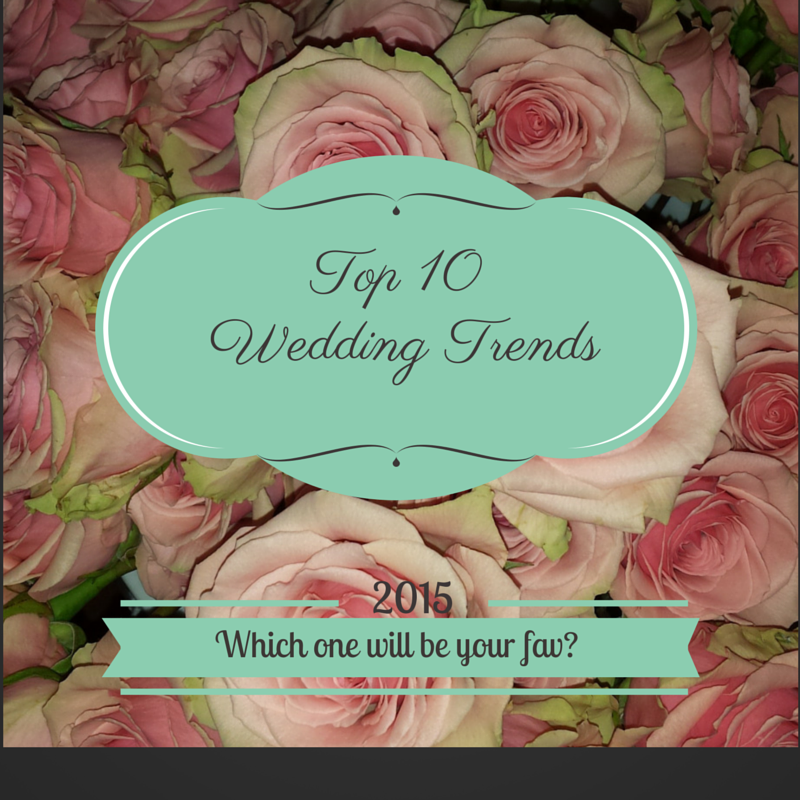 As 2014 comes to a close we look forward to what will be trending for Weddings in 2015. Many couples will be celebrating the biggest day of their lives and will be searching, pinning and posting the latest trends. But where do you start planning your big day and how do you incorporate your personalities? It’s all in the details, of course! Here are the most noteworthy wedding trends we’ve got our eye on this year. 1. Top Blooms: English roses, peonies, hydrangeas, dahlias and ranunculus continue to be go-to favorites among brides. Their dramatic and romantic feel are perfect for whether you’re planning a traditional affair or something more relaxed. 2. Green with Envy: Herbs like rosemary and mint, lemon leaf, magnolia leaf, ivy, smilax and baby’s breath are being strung together and used in surprising ways. Guests will be green with envy when they see how you use these as table runners or chair ties, to frame cocktail menus or to give chandeliers a soft edge. 3. Extra Sparkle: The use of buttons, ribbons and gems on invitations and stationary are wowing guests! Couples are adding attention-grabbing details to their invitation suite with shimmery cellophane, decorative paper, fancy ribbon, leather rope, baker’s twine and studded with crystals; or adorned with dried flowers. 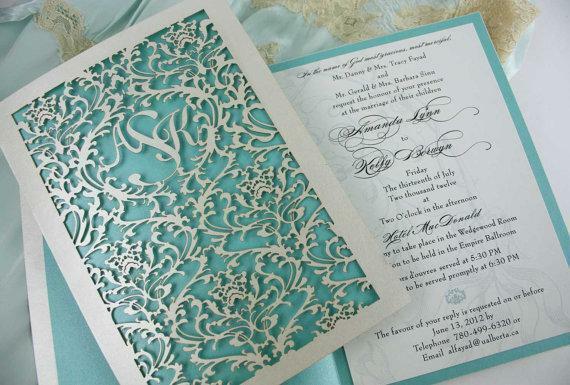 What will really be huge this year will be the laser-cut invitations. 4. Champagne with a Twist: The Champagne tower has returned in a big way – and for a more casual, colorful option try adding in fruit purées to create a signature cocktail that matches your palette. 5. Sip and Savor: Let your guests enjoy flights of craft beer, shots of different bourbons, wine samplings, a sangria palate or even a soda bar. This is a great way to show off your personal tastes while letting guests sample an array of beverages, not to mention the added bonus of helping you keep your bar budget in check. 6. Family-style Dining: The overall guest experience is a big goal for today’s couples. And nothing gets a conversation going quite like a meal served family style, with guests passing beautifully plated entrées and sides. 7. Tiny Tastings: Tasting stations have taken over the cocktail hour allowing couples to show off samples of their favorite foods. From sushi bars and mac-n-cheese bites, to make-it-your-own taco stands or local food trucks, the idea is to surprise your guests with an unexpected assortment of fun food. 8. Favorite Flavors: Try choosing cake flavors that are rooted in your hometowns or family heritage, where you began dating each other or your favorite vacation spot. Flavors such as chai latte, honey lavender and key lime are just a few. Combine these flavors to create the cake that’s perfect marriage of the both of you. 9. Picture Perfect: Photo booths with an artistic twist will be hot this year. By incorporating custom props or a specially designed background to make it personal. These pictures will be a memory of your wedding so you’ll want to add a little flare to this guest favorite. Consider hiring an onsite silhouette artist as well. This is another way to personalize the photos for your guests. Welcome to our blog where you will find tips, insights and colorful images of what we are truly passionate about...weddings, of course! We hope that you will be inspired! Sit back, relax & enjoy the ride!